Get all cozy with over 21 of the most delicious soup recipes to keep you warm all fall and winter long! These soups are delicious, nutritious, and easy to make. I’ve definitely dusted off my Crock Pot and my dutch oven. It’s been pretty chilly and rainy lately and soup has a wonderful way of filling me up, keeping me warm, and staying pretty healthy. October has been all of over the place when it comes to weather. It was 90 degrees one day and the next day it was 55. The last few weeks have been pretty much all fall weather days and that chilliness needs to be warmed up with tea, soup, and comfort food. To top it all off, I’ve been sick the last week so I’ve only wanted comfort food…and my mom. I’m in my 30’s and when I get sick I still want my mom to come over and cook for me. I said it. I’ve confessed. Still a kid at heart. Soup really is the answer for most problems. Need a quick dinner idea? Soup. Need a healthy dinner recipe? Soup. Sick? Soup. Cold? Soup. Sad? Soup. See where I’m going here??? 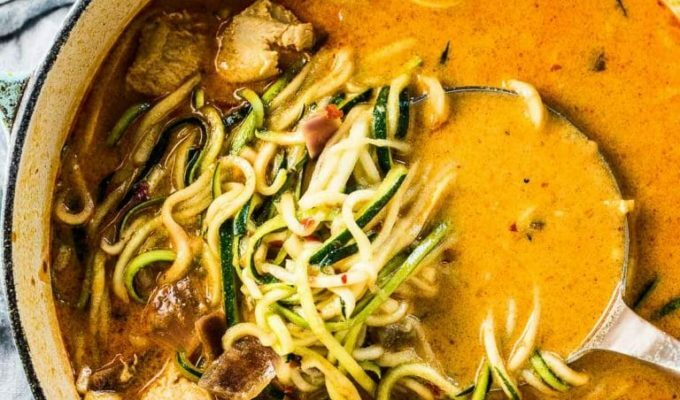 So, we’ve rounded up some of the most delicious soup recipes to solve all of your problems. They are super delicious, mostly healthy, and everything you need to keep your warm, happy, and cozy until we come out of hibernation in March. SO much inspiration here! My mouth is watering!